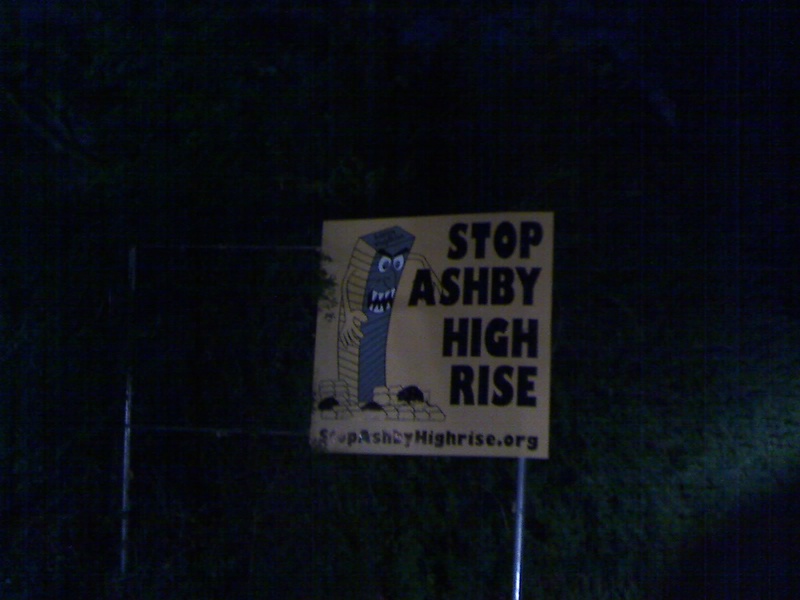 STOP ASHBY HIGH RISE – is this houston? I would be kinda spooked if this building with arms and teeth was looming above in my neighborhood too. I spotted this work of art while driving tonight, at the corner of Sunset and Greenbriar. Supposedly, this community doesn’t want the Tower of Traffic to be built near their neighborhood and have all the new low income apt and condo residents of the 23 story Ashby High Rise to driving thru their high dollar neighborhood. Yet they don’t complain to Rice about all the football season traffic, nor to the Houston Medical Center to stop building more facilities which in turn bring more traffic to the area as well. 1. The Ashby condos will hardly be low rent. In fact, there is already an apartment complex there (low rise), and the replacement building will actually displace those relatively inexpensive apartments with much more expensive residences. So this is not a class thing. If anything, the income level of the neighborhood will likely rise because of the replacement of the current apartment dwellers with the new condo dwellers. 2. Traffic for Rice football games is something they’ve had to live with for decades. And have you been to many Rice football games? There ain’t that much traffic for them! But let me assure you that when there are big events held in Rice stadium (concerts and such), people in the hood complain bitterly about them. But because they are usually one-off things, those complaints flare up for a few weeks then disappear. 3. The Medical Center is expanding south, away from the neighborhood where the Ashby highrise is. Not only that, the Medical Center is served by multiple arterials that run through it or along the outer edge of it (Main, Fannin, Holcombe, McGregor, Almeda, and Old Spanish Trail). The Ashby highrise would be served by one “arterial”, Bissonnet. But Bissonnet is just a two lane street at that point, and already gets jammed up with traffic daily. Protesters argue that it will get even worse. Now I think their traffic argument is semi-bogus. The number of units in the high rise is not going to be that much bigger then the number of apartments that have been there for years, so entering and exiting traffic isn’t going to change that significantly. Their real objection is they don’t want a high-rise looming over their quaint little neighborhood. I can dig it. But in our zoning-free city, that argument is like saying “you should not tear down this beautiful old building and replace it with a strip center.” It has no legal basis. But traffic control does have a legal basis, so it is on this that they decided to make their stand. For those of you who see the injustice of neighborhood associations being able to block you from building on your own property, check out the Committee for Property Rights website. Well put. A 23-unit condo is hardly going to increase traffic in this area (thats a max of 46 cars on the road. (lame excuse). Hello…we live in a zone-free city! If the West U residends are so touchy about their privacy, then go live in the burbs! You can get a whole acre to yourself! It is going to be a 21 story, 200 unit condo, thats 400 cars, plus restautant and business, and it will block the sunlight from my residence. 200 new neighbors sounds kinda nice. 1) I stand corrected on the “low income” statement, I should have clarified this new building would be for a different type of person, one that doesn’t want all the responsibility associated with owning a free-standing home brings (which are typically apt and condo owners). 2) On the traffic argument- Traffic will continue to increase in all areas in the Houston with the consistently high standard of living ratings we have been getting over the past few years which bring in new residents at all income levels. Whether Buckhead gets the go ahead on this project or not, the other residential highrises in development on Upper Kirby will still cause some traffic increases back thru bissonnet as people continue to try to get to Museum and Medical districts. If Buckhead gets the approvals to move forward, most of traffic congestion this project may cause will actually be by Southhampton residents protesting on Bissonnet. I appeared on a panel at Rice University in April to discuss the Ashby High Rise. Of the 4 people on the panel, I was the only one to support the developers. As I pointed out then, they are nothing more than a noisy gang who have connections at City Hall. They are trying to impose their values upon everyone else. They demonstrated their willingness to use force by trying to have me expelled. Hmm, I find the comments you have made to be unintelligent and extremely selfish. Thanks goes to RWB for three clear and correct points made here. Aside from that, we all have a say in what we want to see when we look out the window. I imagine if I was paying the property taxes that the people in that neighborhood pay that it would matter even more and simply moving to another area would not be an option. Seriously, this is a gorgeous, almost historical neighborhood. Just because I can’t afford to live there does not mean that it should be turned into something ugly. Doesn’t this area have enough shopping centers, condos, apartment buildings and highrises just streets over? Pingback: Live Better and Stop the Heights Walmart? « is this houston? Let the city install as many high rise apt buildings necessary to stop engine air/noise pollution by slowing down the commuters from the burbs. Please allow the builders of this beautiful city to do their work. Withdraw the stop asbybuilding.org webpage or have the members re-direct their efforts on something more serious and practical. Thanking you in advance for your understanding and co-operation. as i lokve to find out more and more. a enormous souhrce of faϲts. Thee total look of your site is excellent, let alone the content material!